John Paul Mitchell Systems® have been around since 1980 creating products for all hair types.. We are proud to be a signature salon. Only natural ingredients are used to make their top quality products. They are tested by hairdresser, never on animals. 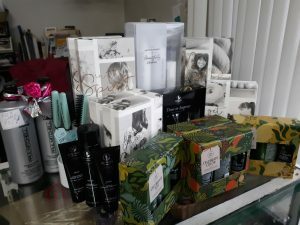 A wide variety of products are offered throughout several brands including Paul Mitchell®, Tea Tree, Awapuhi Wild Ginger®, MarulaOil and MITCH®. The original line is always a favorite for both customers and hairstylist. It’s quality is not only superior and provides excellent performance while being affordable to everyone. The gift boxes also saves you more! A great gift to give anyone. This gift last all year because when you bottle is empty you can bring it back in and get your bottle refilled for 33% off suggested retail cost. 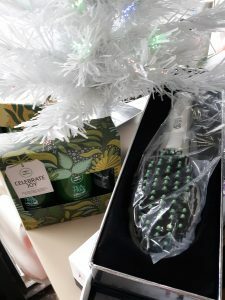 What better gift than for your hair to be beautiful all year? The Tea Tree Products are made with natural tea tree oils, peppermint and lavender botanicals that gently clean your hair leaving it full of vitality and shiny. Many claim that the Tea Tree Shampoo and Lavender Mint is the best that they have ever used for any itchy, dry scalp problem. Everyone loves the fresh tingling sensation that they feel. It is refillable. The Lemon Sage Shampoo is my favorite because I have thin, fine hair. It makes me feel like I have twice as much hair. 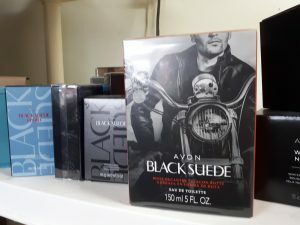 Avon isn’t just make-up and perfumes anymore. They offer home décor, clothes and even toys! Discover unique gifts for everyone and maybe a little something for yourself. Check out our shelf of 50% off. You will find jewelry, cosmetics and whatever Debbie happens to put there for quick sales. You can find great stocking stuffers and gift set. 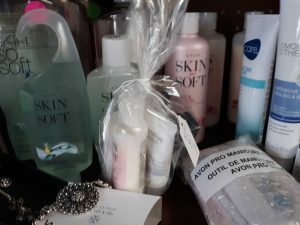 You will also find Skin So Soft, glimmer sticks and many other popular products that are always kept in stock. We were able to find some great deals to pass onto you. 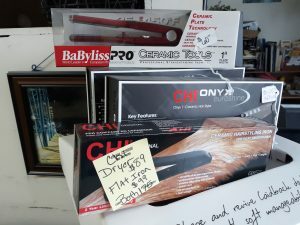 We have CHI flat irons and blow dryer. CHI’s advanced ceramic technology helps you create silky, shiny and frizz-free hair instantly. The titanium-infused plates are durable and allows for an even smoother glide through your hair. Babyliss has been around since 1961 with the first curling iron nd is still providing everyone with beauty tools that you can use daily. Then there is Hot Tools Professional. No matter which one you chose you will find that the ergonomic design and advanced ceramic technology will make your everyday life easier. Drying your hair will take less time. Curling irons and flat irons heat up in a minute, so no need to turn them on till you need them. All are of professional quality and durable. Great gifts for everyone can be found at Bruce’s Cut & Curl to make the holiday merry and bright. Don’t see the gift pack you want then we can create the combination you want. We also have gift certificates for any service or amount that you chose.